The new generation of the Falcon mobile terminal impresses with robust construction (IP64), ergonomics, diverse features and intelligent tools for configuration and maintenance – perfectly adapted to the different requirements in retail, sales centres and warehouses. It features either a 1D laser scanner (HP or XLR) or 2D imager incl. 3 MP camera. Besides the powerful performance (scanning range of up to 1,376 cm), data is entered using the 320×240 pixel display with touch screen or the backlit keypad with 29 or 52 keys. The Intel XScale processor with 624 MHz processes the data extremely quickly, while the parallel computer architecture with co-processor guarantees smooth operation of multi-task applications. Windows CE 6.0 or Embedded Handheld 6.5, 256 MB RAM/Flash, as well as the wide assortment of interfaces and connection standards (USB, RS232, Ethernet, Bluetooth, 802.11 a/b/g Wi-Fi) further ensure absolute flexibility for meeting every need. The long operating times of the lithium-ion battery, diverse tools and emulations, as well as the large supply of accessories for handheld and pistol grip versions expand the range of applications many times over. With its durable housing use the Falcon X3 for both indoor and outdoor applications without worries. The IP64-certified sealing ensures for practical protection against foreign objects such as dust and splash water. Even if the Falcon X3 should accidentally fall, even onto concrete, nothing will happen to it. Up to a height of 1.8 m you can be sure that this mobile terminal will continue to function normally. Even extreme temperature changes between -20°C and +50°C are no hindrance. Therefore, cooled areas and even outdoors during the winter continue to be working environments. Both the variants with a laser scanner as well as the ones with a 2D imager come with Datalogic’s patented Green Spot scan confirmation. 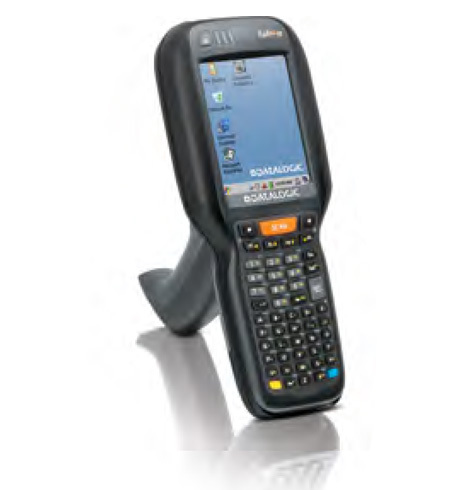 This innovative function ensures that the barcode scanning process always runs smoothly. If the scan is successful, the Falcon X3 directly shows a green spot on the barcode. It only takes one scan for the user to know that the barcode was successfully captured. Software errors from double scanning are now a thing of the past. Use the pre-licensed PAL software to easily tailor the data collection to your needs.